I heard that you wanted to know what I've been up to. Its raining here in Austin, so I haven't been able to play outside today. I hear it is raining in Dallas too and you are bored. As you can see, I've been trying to entertain myself at school. At least there is a little slide I can play on. As you can see, my friends Oliver and NeNe are building a tower of blocks behind me. I plan to go over and knock it over as soon as they finish building it...hehehehe. NeNe is kinda my boyfriend. He's the reason I let mom put clothes on me and go to school, but please don't tell him....I don't want him to think that just because he can get the prettiest girl in pre-school to like him now...it might be a rude awakening by the time he's in High school that he may not have ended up being all that cool. 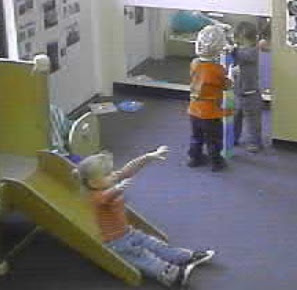 Its a pity to peak in pre-school. Uncle Paul is very happy with Alice's latest activities and can't wait to hear more about her adventures.